Spring is here and summer is on the way. For many homeowners, it’s time to break out the shovels, lawnmowers, trowels and other landscape equipment. And for many, this is the season to look beyond maintenance. If you are considering adding, modifying your hardscape architecture, we invite you to consider the many benefits, both ecological and aesthetic, of installing permeable pavers. And elegance to your hardscape with permeable pavers. Let’s start with the basics. 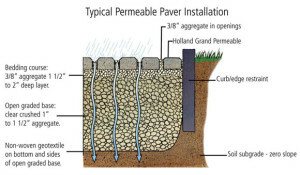 Permeable pavers are a type of paving stone set atop a base that allows water to be absorbed into the ground rather than pooled and dispensed as runoff. Because of there strudy construction and durable installation techniques, permeable pavers can be used for driveways, walkways and any other hardscape application you need. Any sustainable hardscape design requires reducing the amount of surface water runoff that might be caused by the installation. As their name suggests, hardscapes installed with permeable pavers allow water to permeate the surface and filter into the ground in a natural and environmentally sensitive way. 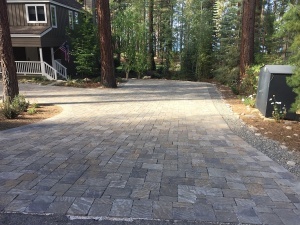 The permeable paver design is so effective at reducing water and runoff pollution that some municipalities in environmentally sensitive areas, such as Lake Tahoe, require all hardscape to incorporate permeable and pervious designs. Go green with permeable pavers! By allowing water to filtrate into the ground, the surface and surrounding area temperatures will be cooler than a hard impervious surface. Bonus points for using permeable surfaces that are also light in color, because they will also help reflect sun and heat to even further reduce the local ambient temperature, which will also improve the health of local vegetation and improves air quality. Generally, permeable surfaces just look better. Instead of plain old concrete or high maintenance, ugly and toxic asphalt, permeable surfaces come in a variety of styles that pretty much always look the best. Options range from standard wood decking brick, stone or concrete pavers; pervious concrete; interlocking open grid ‘grasscrete’ pavers; gravel, river rock or glass, etc. With over 20 years of experience installing pavers and stone veneers, Eric’s Concrete Pavers promises their natural stone and paver installations will exceed your expectations. Our professional team will make sure that you get the quality you deserve. Choose from a range of hardscape options including concrete, permeable and pervious pavers, heated driveways pervious concrete and more! Come check out all our products and view our installation portfolio. Contact us today!